We have recently solved a number of puzzles relating to our Stewardson family in Namibia. Val’s great great grandmother was Kate Stewardson (1848-1898), or Catherine Anne Agnes Stewardson, to give her her full names. She married Fred Green at Otjimbingwe in 1865, and after he died in 1876, she married George Robb. She gave birth to 16 children, only five of whom lived till adulthood, most of them dying in infancy, and one as a teenager. As Fred Green wrote to his friend and business partner, Charles John Andersson, if the children got sick as they travelled around in the bush by ox wagon, there was nothing one could do. There were no doctors, no nurses, no hospitals. He wrote of how helpless he felt, knowing that there was nothing he could do except hope that they recovered, as they sometimes did, or, in most cases, didn’t. Anderson might not have sympathised, as he had opposed Fred Green’s marriage to Kate, and thought it a bad match, though he never said exactly why. One can, however, speculate. Kate was Fred’s second wife, and she was 20 years younger than him. He was nearly 36 and she was 16 when they were married. His first wife was a Herero princess, Betsey Kaipukire Sarah ua Kandendu, and it is not clear what happened to her. Did she die, or did he abandon her for someone younger and prettier? At any rate their daughter Ada Maria Green was only two years old at the time of his second marriage. Nevertheless, as Andersson wrote in his diary on the day of the wedding, “the thing is done”. There is more about Fred Green on our family wiki page here. When we began researching the family history, and got back on the Green side as far as Fred and Kate, were stuck. One of the most informative sources was a book by Edward C. Tabler, Pioneers of South West Africa and Ngamiland, 1738-1880 which is a series of potted biographies of adult male foreigners who were in Namibia before it became a German colony in the 1880s. Women and children are only mentioned in passing. Tabler culled his information from other published sources, and collected it together conveniently in one place, so it is a very useful book. But the names of Kate’s parents are not mentioned anywhere. Her father is “Stewardson the elder” whose three sons, William Charles and James, Tabler refers to as “a bad lot”, the youngest brother, James, being “a bit of a scoundrel”. They were hunters and traders around Omaruru in the mid 1870s, and that’s all we know. His wife was “a daughter of one of the Morrises” — and he mentions two Morrises, Thomas Morris the elder, and Thomas Morris the younger, who, according to Tabler, was a nephew of the elder. C.H. Hahn, a German missionary at Otjimbingue, mentioned in his diary the arrival of Stewardson with his brother-in-law Morris, the Wesleyan trader, with whom he lived in fierce enmity. So all we knew was that a nameless Stewardson had married a nameless Morris, who had a brother Thomas, who took over his uncle’s business. In 2003 we went to Cape Town on holiday and found a document about the Morris, Huskisson and Titterton families, which said that the Morris who did business in Damaraland was a James Morris, and from other sources as well it appears that this James Morris was indeed the brother-in-law with whom the elder Stewardson lived in deep enmity. And perhaps that enmity explains why James Morris’s sister Frances, who married Frank Stewardson, does not appear anywhere in that rather long and detailed document. And then we found, in a Methodist Church register from Cape Town, the baptism of Elizabeth Stewardson, daughter of Francis and Frances Stewardson, so at last we had a name for the elder Stewardson, who was apparently also known as Frank. In addition to their three sons, the Stewardsons had four daughters: Elizabeth, Frances (or Fanny), Catherine (or Kate) and Charlotte. And they all married traders who plied the route between Omaruru and Walvis Bay. Elizabeth married Oskar Theodor Lindholm, from Sweden. Fanny married Axel Eriksson, also from Sweden. Kate, as we have seen, married Fred Green (who was from Canada) while Charlotte Caroline Stewardson married John Gunning of Walvis Bay (and just to confuse things, one of their daughters married a John Harold Green, who was unrelated to Fred Green). And one of the Lindholm daughters married another of the traders, Charles (or Carl) Reinhold Carlsson. We have information on several of their descendants, so if you think you might be related, please get in touch. Twent years ago Val also found, in the Windhoek archives, an Emily Jacoba Stewardson who married a Jacob Dennewill, an Alsatian. Where did she fit in? Was there a fifth Stewardson daughter? We left her unattached, and earlier this week things fell into place. A cousin of one of the Eriksson descendants put us in touch with Naomi McFadden who hasd been recording the Omaruru cemetery. We did have a record, also found in the Cape Town archives, of a rather messy divorce between Axel Wilhelm Eriksson and Fanny Stewardson. She had taken the children to Cape Town because there was a war on in Damaraland, and while there had an affair with the lodger, one Clement Stephen Stonier. So when Axel came to Cape Town and realised that young Emily could not be his, he divorced Fanny. And so Emily who married Jacob Dennewill was the daughter of C.S. Stonier and Fanny Stewardson. Fanny went back to Omaruru, and had a couple more daughters by the Herero cook, whose name is only recorded as Johnathon. One of the daughters died young, but the other may also have descendants somewhere. And one of Axel Wilhelm Eriksson’s sons, Andrew or Andreas, went to Sweden, changed his surname to Waerneman, and became a priest. No wonder we couldn’t find him. But many thanks to Naomi McFadden of Omaruru, Bo Lindquist, and Peter Johansson of the Vänersborg Museum, who helped us to find missing links, fill in some gaps, and gave us the clues we needed to make further links. Married to Axle Eriksson 18 September 1871 in the first Christian wedding in Omaruru at the Mission House (married by Missionary Gottlieb Viehe and divorce around 1886. 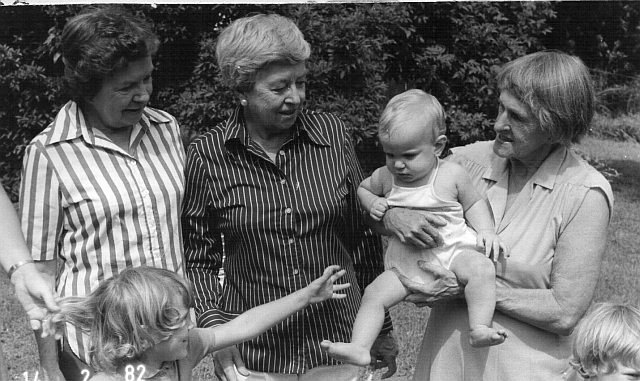 Here’s a photo from 30 years ago, when we were living in Melmoth, and my mother, Ella Hayes, came to visit us with her cousins Betty Stewart and Nancy Badcock. Several members of the Hannan family came to South Africa some time in the first decade of the 20th century including David McFarlane Hannan (1884-1951), the father of Nancy and Betty, and his sister Janet McCartney Hannan (1882-1946), who married George Growdon — Ella Hayes (1910-1983) was their daughter. David Hannan married Agnes Lindsey Irvine, and Nancy’s full name was Agnes Lindsey Irvine Hannan (1925-1984). Betty was Elizabeth Hay Irvine Hannan (1911-2002), named after her maternal grandparents, Alexander Christopher Irvine and Elizabeth Hay. David and Agnes moved around quite a bit. After coming to South Africa they returned to Scotland, where their middle children, Tom, Alexander and Stanley, were born, and then returned to South Africa and moved to Zambia, then known as Northern Rhodesia.